HA NOI - The Ha Noi Sewerage and Drainage Company has prepared a plan to prevent possible flooding of Ha Noi's streets during National Day on September 2. The National Centre for Hydro-Meteorological Forecasting has said heavy rain might hit the northern region, with some areas receiving 200mm to 300mm, or even 400mm, of rain. 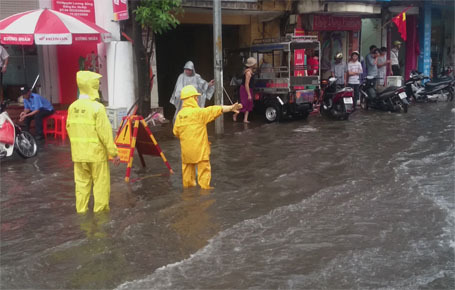 The centre said there would be possible thunderstorms with rain in Ha Noi on Wednesday that might cause flooding in some streets of the city. The sewerage company's Deputy Director Le Vu Quang Suong told Dan Tri online newspaper that all employees of the firm would be ready to prevent flooding on National Day. "About 2,000 workers and 100 professional machines will be mobilised 24/24 to cope with possible flooding in Ha Noi," Suong said. increase its drainage capacity, especially of streets with a high population density, stations and tourist sites. Pump stations, such as Yen So, Kim Lien, Tan Mai and Trung Tu, will be operated at their fullest capacity to prevent possible flooding.